“Maintaining the Monuments ,” Histories of the National Mall, accessed April 22, 2019, http://mallhistory.org/items/show/497. The National Park Service employs many special maintenance teams to keep the Mall beautiful. Their role is to preserve the monuments and maintain the landscapes. Landscapers care for the grounds and remove 3-4 tons of trash daily. A special crew preserves the monuments and memorials. 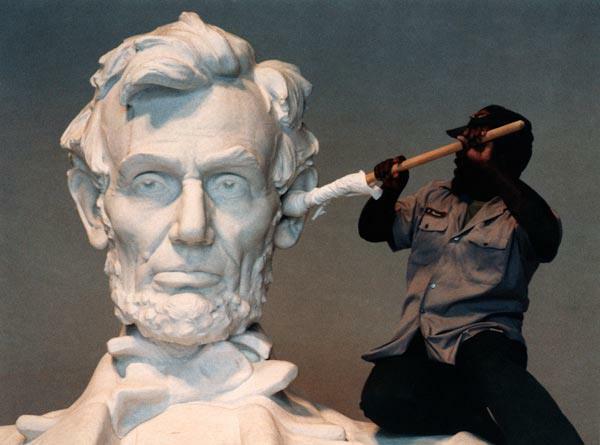 In this photo one such worker cleans the Lincoln Memorial.